Loretta (Lottie) Vaiano, 91 passed away at home surrounded by her loving family at her Mariners Harbor home after a long illness on Tuesday, November 6. She was born in Bayonne, NJ. Lottie is predeceased by her husband, Salvatore (2004), daughter, Donna Vaiano (1997) and siblings, Mary, Helen, Sophie, Adam, Stanley and Steven. She is the mother of Beverly and Mark Vaiano, dear sister of Stella Wadulack and Edward Sambora. Dear grandmother of Erinn, Toniann, Steven and Dearest great grandmother of Mackenzie, Makayla and Ben Vaiano. 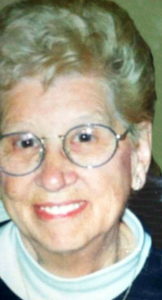 Funeral from Cherubini McInerney Funeral Home on Saturday, 9:45am with a funeral mass at St. Adalbert’s R.C. Church at 10:30am. Burial to follow at St. Peter’s Cemetery. Family and friends are invited to visit on Thursday from 7-9pm and Friday from 5-9pm. In Lieu of Flowers, donations to St. Adalbert’s School, 355 Morningstar Road, 10303 would be appreciated. Our sincere condolences upon the passing of Loretta. May she rest in eternal peace. I was so sad to hear of Aunt Loretta’s passing. She was a wonderful Aunt and was full of love for everyone. She was so proud of her family. I’ll never forget the Christmas Eves in the 70’s me and my family spent at the Vaiano household when she was “directing” Uncle Sal in those amazing Pizzas he used to make every Christmas Eve. Babchi and my Mom would chuckle it was so much fun, and I think of that every Christmas to this day. And those great Summer 4th of July Barbeques and those Jovi Concerts. I know she must be smiling down on us right now from heaven. She is Home. I’m so sorry for your loss. She was a wonderful lady. My thoughts and prayers are with you all. Condolences to the families. May God hold you, keep you and guide you in this time of sadness true to His promises that He is close to the brokenhearted. May she rest in peace. It is well with her soul. May God grant you all peace in this difficult time. She lived well and leaves behind fond memories of love and joy. We greet you with the knowledge that as you lived on earth your legacy will be carried forth by those close and dear to you. I will always remember Mrs. Vaiano as a fun loving, warm and friendly mother and person. She will be missed by all. Our deepest condolences to the Vaiano family. Peace, Prayers & Love to Lorretta in Heaven. What a beautiful soul. My deepest sympathy to the family. May GOD bless each and everyone during this difficult time of grief. Sending prayers for healing your hearts. So sorry for your lost. Thoughts and prayers are with you all. My deepest sympathy to the Vaiano & Sambora families on your recent loss!